BACKGROUND: Neuroleptic malignant syndrome (NMS) is a rare sideeffect of neuroleptic medication. Most NMS reports have been on adults, and the incidence in children and adolescents is unknown. Objective. This report reviews cases of NMS to highlight possible risk factors for the development of NMS in adolescents. METHOD: Four cases of probable NMS in adolescents diagnosed in the Western Cape between February 2009 and March 2010 are presented. RESULTS: Risk factors in the development of the syndrome in adolescents in the Western Cape may be male gender, polypharmacy, the use of zuclopenthixol acetate (clopixol acuphase), a previous history of extra-pyramidal side-effects or NMS, and a history of substance misuse - in particular methamphetamine. CONCLUSIONS: Caution must be applied in the apparent overuse of intramuscular antipsychotics, and especially zuclopenthixol acetate (clopixol acuphase), in neuroleptic-naïve and agitated psychotic adolescents where the short-term use of benzodiazepines is more appropriate. 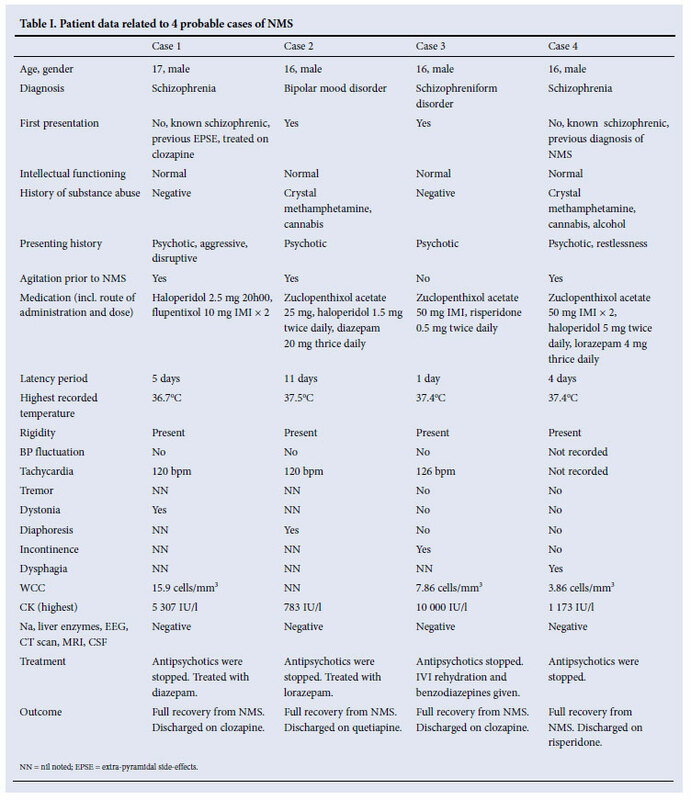 Table I presents data from 4 cases of probable NMS seen between February 2009 and March 2010; all were eventually referred to, and managed at, a rehabilitation unit for adolescents with psychosis at Lentegeur Hospital. They represent 3.6% of admissions over that time. While reference is made to a diagnosis of NMS, it is acknowledged that the evidence is circumstantial and, while fairly strong, is nevertheless presumptive. The cases suggest that male gender and polypharmacy (including the use of 2 or more antipsychotics), a past history of EPSE/NMS and agitation are important possible risk factors for NMS. Although intellectual disability and affective disorders are considered to increase vulnerability to NMS, these cases occurred in adolescents with normal intellectual functioning and without an overwhelming association with affective disorder. Other features include large variations in CK levels and a favourable outcome. Other key risk factors for NMS include: use of physical restraint to control psychomotor agitation, recent commencement of an antipsychotic regime, use of intramuscular antipsychotics, and excessive psychomotor agitation resulting in higher levels of dehydration.5 This raises the dilemma about appropriate, yet safe, use of antipsychotics in youths who need antipsychotics to control their behaviour, in particular those receiving high doses in short time periods.5 Zuclopenthixol acetate (clopixol acuphase) is a common denominator in 3 cases (2, 3 and 4), and oral haloperidol was co-prescribed in 3 cases (1, 2 and 4). The Cochrane systematic review database found limited efficacy data for claims that zuclopenthixol acetate would rapidly calm or sedate aggressive patients with schizophrenia.6 Therefore, the use of zuclopenthixol acetate in neuroleptic-naïve adolescents with a firstpresentation psychotic illness, and for the specific purpose of rapid tranquillisation, must be carefully considered. Body temperature recording in this series was often taken haphazardly and in difficult circumstances such as marked agitation and restlessness, when it is unsafe to use the oral method. Temperature readings were obtained from the axilla. In one case the temperature was never recorded, one patient had no pyrexia, and 2 patients showed only a mild elevation. A core feature of NMS is pyrexia; therefore it could be argued that at least 2 patients did not conform to a 'true' NMS. However, the additional signs and symptoms noted in all the subjects were consistent with a probable diagnosis of NMS. Important differential diagnoses in adolescents with probable NMS are malignant hyperthermia, heat stroke, anticholinergic delirium, serotonin syndrome, central nervous system infection and neuroleptic-induced dystonia. The latter occurs within 7 days of initiating drug treatment or following a rapid increase in the dose and is an involuntary contraction of muscle groups forcing certain parts of the body into abnormal, sometimes painful, postures. It is not associated with fluctuations in blood pressure, pyrexia, tachycardia or any other additional signs or symptoms seen with NMS. Silva et al.1 emphasise that, in children and adolescents, NMS presents in a form and course similar to adults. A fatal outcome is associated with age <12 years, although the number of fatal outcomes has dropped sharply in all age groups in recent years. A milder course of NMS associated with atypical antipsychotics, a greater resilience in children, earlier detection, prompt antipsychotic discontinuation and more aggressive management of NMS are additional moderating factors.3 The latency period in these 4 cases refers to the time elapsed between the administration of an intramuscular antipsychotic and the diagnosis of possible NMS. Signs of NMS develop within 24 hours in 16% of patients initiating antipsychotic medication, 66% by 1 week and 90% within 30 days, and NMS is less likely to occur after 30 days.9 Treatment of NMS includes referral to a medical unit, fever reduction, intravenous rehydration, dantrolene and bromocriptine, and sedation with benzodiazepines. Electroconvulsive therapy is an effective treatment option both for the NMS and the underlying psychiatric illness.3 After resolution of NMS and normalisation of CK level, a 2-week waiting period is recommended before re-exposure to antipsychotics. In 2 of the 4 cases, crystal methamphetamine, a street drug manufactured from ephedrine or pseudo-ephedrine that is smoked or injected and popularly known as 'tik' in the Western Cape, was one of the substances used prior to illness. Its use has accelerated in the Western Cape since 2003, particularly among the youth. This observation suggests a possible relationship between substance abuse and the development of NMS. Methamphetamine causes the release of dopamine and noradrenaline (and, to a lesser extent, serotonin) into the synaptic cleft and inhibits their reuptake. This creates very high intrasynaptic dopamine concentrations that probably accelerate or exacerbate the psychotic process. Chronic use of stimulants such as methamphetamine or cocaine may predispose the individual to NMS.11 A hypothetical mechanism is that the initial dopamine stimulation induced by methamphetamine is followed by a depletion of neuronal dopamine reserves with continuing use of the agent. The resulting dopamine deficiency would be aggravated by the therapeutic administration of antipsychotics that further compound the hypodopaminergic state by their blockade of post-synaptic receptors. These events establish a setting of reduced dopamine activity, which is probably the aetiological basis for NMS. Ethics approval was given by the University of Cape Town Research and Ethics Committee, and the Tygerberg Hospital and Lentegeur Hospital authorities provided permission to extract data from patient folders. I thank Professor Ashley Robins for his assistance in the writing of this paper, and Professor Denise White for her encouragement.